In the year 1963, some high school pals decided to get together to form a group because of their love of music. After 43 years, several dozen albums… three of which became gold, one of which became platinum, and one gold single from a song known as “Jim Dandy To The Rescue,” which was told to them to record by none other than Elvis Presley himself (! ), this group of friends still manages to stay together. (After talking to Elvis, Black Oak Arkansas was told the following week by their producer Tom Dowd and by their label president Ahmet Ertegun that these two industry giants were also about to ask BOA about recording that same tune! Ahmet himself only personally signed 5 groups to recording contracts in his long, long recording history… and Black Oak Arkansas had the honor of being number 5!) Many testimonials and awards have been presented to this band by everyone from Bill Graham, (who founded and ran Winterland Ballroom and both the Fillmore East and West), to Wolfman Jack from the Midnight Special; from First Lady Betty Ford to President Bill Clinton! 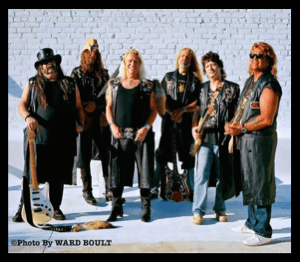 In their long musical history, the BOA boys have shared a stage with the likes of James Gang, Kiss, The Who, The Rolling Stones, Bob Segar, King Crimson, Emerson, Lake and Palmer, Black Sabbath, Foghat, Bad Company, Bruce Springstein, Boston, Iron Butterfly, Grand Funk Railroad, B.B. King, Ted Nugent, Alice Cooper, The Outlaws, Deep Purple, 38 Special, Marshall Tucker, Buddy Miles, Billy Preston, Jerry Lee Lewis, BTO, Robin Trower, Humble Pie, Earth, Wind and Fire, The Eagles, Blackfoot, Credence Clearwater, Johnnie Winter, Edgar Winter, Rick Derringer, Stepphenwolf, Allman Bros., The Doobie Brothers, Z Z Top, Chuck Berry, Lynard Skynard, Charlie Daniels, James Brown, Steely Dan, J. Geils Band, Cheech and Chong, Steve Martin, Danny Thomas, Evil Kenevil, and the list goes on and on and on! Warner Bros. has released a DVD on the early years of the band, and recently charged forth with a release of a Black Oak Arkansas DVD live at Royal Albert Hall in London. BOA has donated hundreds of thousands of dollars to charities in their career, and the governor of the State of Arkansas even declared a “Black Oak Arkansas Day” on October 6th. There is now a permanent display in the Arkansas State Museum and the Barton Coliseum in Little Rock dedicated to the band.